Throw on this dress and look like the deadliest bounty hunter in the galaxy! You may not have quite the intense and scattered past that one would normally go through to become a bounty hunter of Boba's caliber, but you sure will have the look down. Fett has personally and successfully taken on some of the most dangerous missions in the galaxy and raked in some of the highest paid bounties ever made. Yes, he may have been trained by his father, Jango, and then grew up alongside some of the most notorious bounty hunters known in existence but is it all that which made him the best of the best? No, we think it was more so to do with his unique style. Boba Fett's armor is based off what the Mandalorian warriors had worn. This race is thought to have been wiped out by the Sith but somehow Boba managed to acquire this extremely rare battle-ready suit of beautiful green armor. And now we are bringing this fashionable attire to you in a much more comfortable skater dress version! The dress is also way lighter than a suit of armor, so if a blinded Han Solo should happen to knock you into a Sarlacc pit then getting out should be no problem at all since all that heavy gear won't be slowing you down. 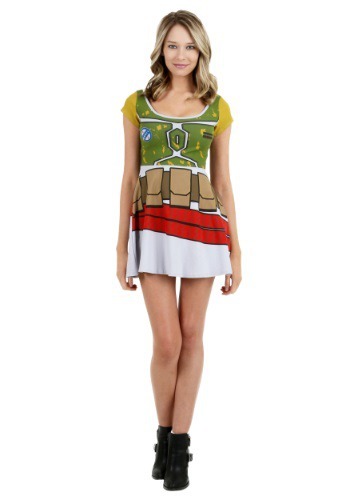 Now all you need is maybe your own green Mandalorian helmet and you can go out for Halloween as the infamous Boba Fett, of course, you can always just wear this awesome dress any day of the week too!